For those who are going through the "dark tunnel "these days: Know that your attitude toward where you are and the challenge you are experiencing can determine how fast you get to that "light at the end of the tunnel" - AS THE expression goes. 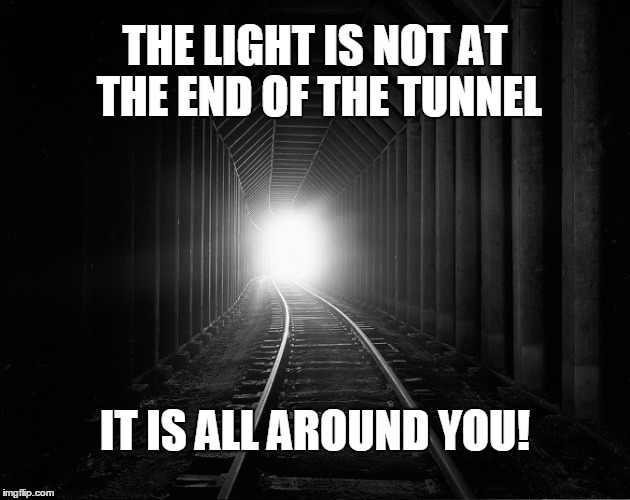 But a friendly reminder the light is not only at the end of the tunnel, IT IS ALL AROUND YOU, IT IS WITHIN YOU. Be the loving space for your challenge - THATS THE LIGHT, I AM SPEAKING OF, be more heart for yourself and most of all, raise above the static noise as you work your way through the shadow of the tunnel. As you become the loving space for the unfolding you are in, then bigger picture is known. These situations present themselves to us so we can raise above them, not to identify with them. You are beyond your human experience. YOU are the light for your human experience..
What does it mean to live in the heart and higher self. MY LOVE IS NOT FLUFFY, MY LOVE IS POWERFUL. it is a reality check.